...that the Warden has gone haywire following the Prison of Elders breakout? "I have a clear purpose. I cannot explain it. Forgive me." Xûr, Agent of the Nine is a vendor who sells extremely rare goods in exchange for Strange Coins and only appears on weekends from Friday to Sunday. In Destiny, Xûr appears randomly at one of six locations in the Tower or one location in the Vestian Outpost. In Destiny 2, Xûr's general location is typically within the Public Sector chosen as that week's Flashpoint, or in the Tower's Hangar area should the Flashpoint be a DLC or Expansion Sector. Xûr's coming and going depends on the planetary alignments, as he hails from the Jovians, a place beyond even The Reef that the Guardians have yet to adequately explore. He is subservient to the Nine, enigmatic rulers of the Jovians, the section of the Solar System past the asteroid belt. Xûr claims that his will is not his own, and he is in complete servitude to The Nine. It is important to note that he is not one of them. Xûr first appeared in the Tower after the end of the Great Ahamkara Hunt. Ikora Rey speculated that the Nine had previously made use of the Ahamkara for their paracausal abilities, and had sent Xûr to interact with the Guardians for similar reasons. Xûr once was confronted by the Guardian Orin, who was sent by Mara Sov to investigate the Nine's role in the disappearance of Sjur Eido. Misinterpreting Xûr's movements as a sign of hostility, Orin struck the Agent in the chest with her war hammer, sending him flying and breaking his spine. Though Xûr survived, he acquired a permanent hunched posture due to his injury. It is possible that Xûr, along with The Nine, are responsible for releasing Skolas from his prison after he was given to them. Every week, the available stock is chosen at random, but occasionally he will sell one item more than once every few weeks. Every week, the available stock is chosen at random. Note that Xûr will not sell both an Exotic weapon and a Legacy Engram during the same visit, only one or the other. Every week, the available stock is chosen at random, but some items may accidentally be featured more than once within a certain timespan. Note that Xûr will not sell both an Exotic weapon and a Legacy Engram during the same visit, only one or the other. Legacy Engrams only contain Year 1 weapons or armor, but if a player receives a weapon that they don't have in Year 3, that same weapon will become available in its current iteration in the Exotic kiosks in the Tower. In Destiny 2, Xûr appears either in a predefined spot within the Destination chosen as that week's Flashpoint, or else the Tower if a DLC Destination is selected. Instead of Strange Coins, he accepts Legendary Shards. Each week, his available stock of Exotics is randomized; he offers one random armor piece for each class, a random weapon, a special 'fated' or 'isochronal' engram that is guaranteed to decrypt into an as-yet undiscovered non-quest armor or weapon, and assorted other items. "I am only an Agent. The Nine rule beyond the Jovians." "I cannot explain what the Nine are. They are... very large. I cannot explain. The fault is mine, not yours." "I think it is very possible that I am here to help you." "Each mote of dust tells a story of ancient Earth." "I think the cells of this body are dying." "I do not entirely control my movements." "Some of the cells in this body began on this world, how strange to return." "There are no birds where I came from. The things that fly... are like shadows." "I understood my mission when the Nine put it in me, but now I cannot articulate it." "This is but one end." "These inner worlds are very strange." "My movements are to a significant degree dependent on planetary alignments." "I feel a great many consciousnesses impinging on mine, and all of them so small and lonely." "Bodies come and go but the cells remember. And if they forget, the Nine remember it for us." "My function here is to trade, I know this." "I have told you what I can." "If I am here, it is the Nine who sent me." "So much Light here, I suppose I feel pain." "Beyond even the outer worlds, the true deep begins." "My movements are not predictable, even to me!" "We saw the colony fail, not knowing what we saw." "My will is not my own." "I am an Agent of the Nine." "I hope to be here again." "It is very possible that the Nine intend to help humanity." "It is my will to speak to you." "An end will come. We will be there." "The Awoken did not have a choice. We did." "I may be here when you return." "I do not know what the Nine want with you." "There is something inside me that wishes to connect." "The Nine show you these." "An end will come. We will be here." "For organic life to exist it requires constant adaptation." "The Nine wish to speak to you." "Do not be alarmed, I have no reason to cause you harm." "But it was the Nine who gave us purpose, and it was the Nine who keep us whole." "We came up from the dust, and burrowed into flesh for warmth, and became... something new." "I have information. I do not know yet if it's you it is for." "The pull of the outer worlds is so faint here. The sun is so heavy." "Your Traveler has a dark mirror." "You are the one I was sent to find!" "When my mission here is done, the Nine will send for me." "I am merely a trash collector for the Nine." "You must stop eating salted popcorn." "Whatever happened would have been the will of the Nine and therefore right, but...I am glad you have won." Xur has sold the famous exotic Rocket Launcher Gjallarhorn on two occasions in Year 1 of Destiny. The first was during the second week he was available to purchase from, however many people didn't buy it due to either lack of knowledge or they didn't have enough Strange Coins with which to purchase it. There was once a bug in Xur's code that meant he didn't sell Three of Coins for a few weeks during Rise of Iron. There is a fan theory that Xur's presence in the Tower may not be beneficial, despite him outfitting Guardians with Exotic wares. 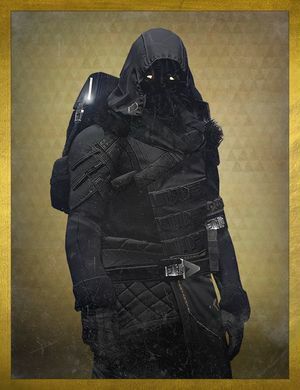 Some fans believe that Xur is in the Tower for reconnaissance purposes and to gather intelligence for his superiors. Before Destiny 2 patch 2.0.0, a symbol for Xûr was displayed in the area he was present in. This has now been removed and makes it harder for player to find him. The reason for Xur's odd posture and voice is explained in the Ecdysis lore book, where Orin finds him in a sublunar cavern and "crushes his windpipe" along with hitting him with her warhammer, cracking his spine so "he will never stand straight again." Xur in his Interact hud. A symbol of the Nine that appears in the Tower when Xûr is present.